Yes, it is possible to actually have fun camping on the snow. Here’s what you need to know to stay safe, dry and (mostly) warm. 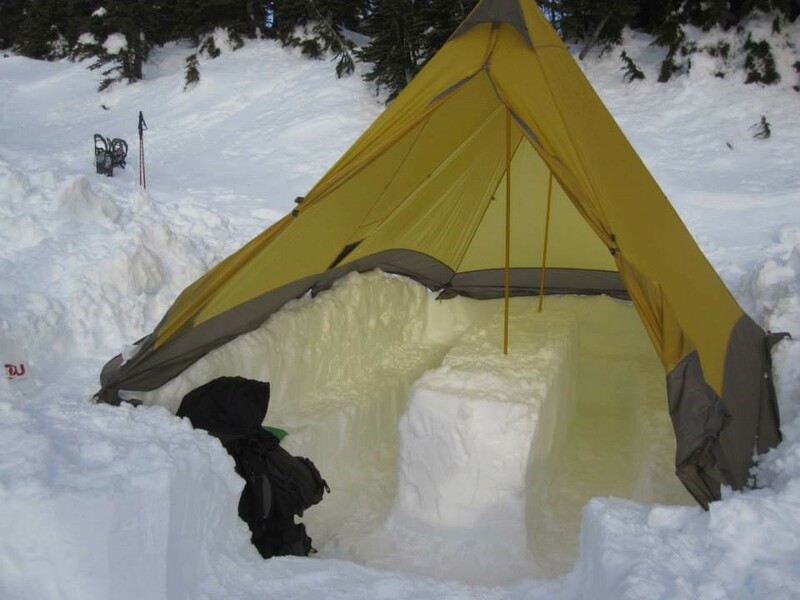 My first winter camping experience was a bit of an anomaly. Yes, I slept on snow, but it was an unseasonably warm February weekend near Mount Hood, with blue skies during the day and overnight temperatures that barely dipped below freezing. What’s more, my camping partners and I somehow managed to find enough dry, downed wood to build a robust fire that lasted until well after the sun went down. Not every winter adventure since then has been as pleasant. There have been outings with single-digit temperatures, an overnight with several feet of fresh snowfall — and zero campfires. But the opportunity to experience our region’s dramatic landscapes dusted in winter white, often with no other people around, has more than made up for any minor discomforts. Doug Terry, a Poulsbo resident who has taught winter travel and snow camping with the Kitsap branch of The Mountaineers since 2002, says solitude is the main thing that motivates him to venture out in the Olympics and Cascades throughout the winter. 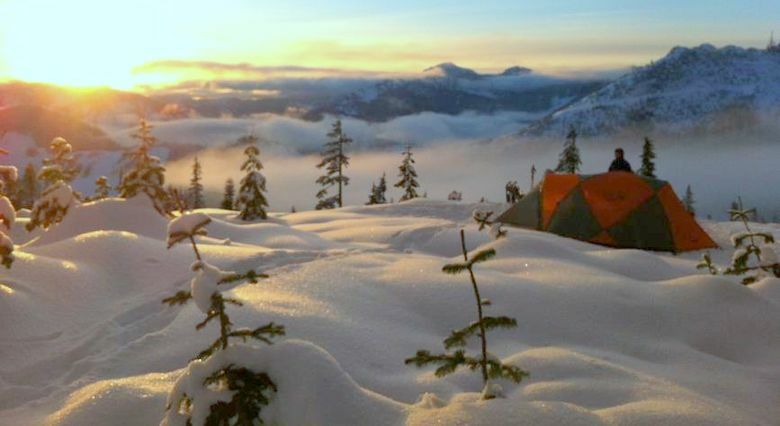 Looking for a spot to try out winter camping? Here are four suggestions that offer reliable road access, a moderate hike in, and relatively low avalanche danger — although it is always wise to check current conditions with the Northwest Avalanche Center (nwac.us) before heading out. Follow the seasonal road as you skirt around the ski resort toward Austin Pass. To escape the crowds, head east along Kulshan Ridge toward Huntoon Point in search of a more private camping spot. Start on the south side of Mount St. Helens at the Marble Mountain Sno-Park and head north on the Pine Marten Trail and June Lake Trail. Washington Sno-Park permit required. This hike is long, but the trail is gentle as you trek along a picturesque river valley. In favorable conditions, those with more experience and energy can extend their trip by climbing an additional 2,200 feet to reach the high alpine lakes of the Necklace Valley. “You’re out there by yourself, things are really quiet … it’s pretty surreal,” he says. If you’re a regular summer backpacker, there’s no need to put your hobby on hold for half of the year. Here’s what you need to know to stay safe, dry and (mostly) warm. Although snow camping draws on many of the same skills and knowledge as regular backpacking (don’t forget the 10 Essentials), venturing out for an overnight in the winter comes with some added challenges. Navigation, nutrition and hydration, and regulating your body temperature all become more complicated in the snow. Start small by picking a destination that’s easy to reach and has plenty of flat, protected terrain for pitching a tent. Snowshoeing or skiing with a heavy pack uses up more energy than summer backpacking, so scale back your mileage considerably from what you’re used to during the warmer months. Terry recommends staying within a few miles of the car for your first outing, in case something goes wrong. He typically takes newbies to destinations near Mount Rainier’s Paradise visitor center, such as Glacier Vista or Deadhorse Creek Basin. And, unless you’ve had the proper avalanche training, stick to trips with mellow terrain. Terry tells his students to avoid slopes that are steeper than 35 degrees and also teaches them to look for hazards such as tree wells, and moats that can form around large rocks during melting periods. 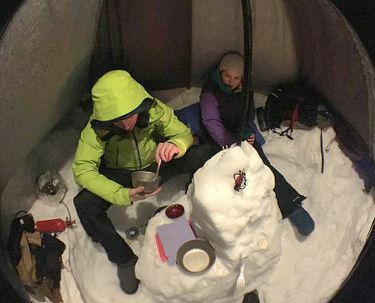 Assuming you’re not climbing to the top of Mount Rainier on your first winter outing, you can bypass the expensive four-season tent. A solid three-season backpacking tent is able to withstand typical winter conditions in beginner-friendly destinations around the Northwest. The setup process has a few extra steps, however: for the most comfort and stability, begin by stomping out a platform in the snow, bury your stakes “dead-man” style, and use guy lines in windy conditions. Rather than a new tent, if you’re going to invest in one piece of gear for winter camping, make it a new sleeping pad. Your body loses heat rapidly when it’s lying on snow, and the more insulation you create, the better. When selecting a sleeping pad, pay close attention to the R-value, a unit that refers to the level of thermal resistance. Terry recommends a pad with an R-value of 5 or higher, although some people pair a less-robust inflatable with a lightweight foam pad, which can also serve as a backup if the inflatable pad punctures. A solid sleeping bag is another crucial piece of gear when camping on snow. Keep in mind that temperature ratings are subjective, and, to be on the safe side, you’ll want to choose a bag that’s rated 10 or so degrees below the lowest temperatures you expect to encounter. Make sure it’s cut to fit close to your body and has a hood that will cinch down around your face. Still waking up cold? Try stuffing an empty backpack or extra clothing underneath your pad, or heat up a thermos of hot water before bedtime and keep it in your sleeping bag. Creature comforts such as down slippers and hand warmers can go a long way in making cold temperatures more tolerable. Of course, all that extra gear adds up to a lot of weight. Terry advises his students to cut out ounces by sharing items such as stoves and tents — which has a dual benefit. “When you’re looking at keeping warm, that second body really helps out and might raise the temperature up 5 degrees,” he said. So you’ve set up camp — now what? In order to get water for drinking and cooking, you’ll need to melt snow and then either boil it or filter the cold meltwater to remove pathogens. This process can take awhile, so don’t wait until you’re already hungry to get started. It’s an ongoing debate whether canister or liquid-gas stoves are a better choice for winter camping; whichever system you choose, bring plenty of fuel for melting snow. Prevent liquids from freezing by keeping them in your sleeping bag or using an extra pair of socks to insulate bottles and canisters. The work of melting snow will be less cumbersome if you take the time to dig out a bench, table and “kitchen” countertop. A lightweight tarp is an extra bit of luxury that provides shelter from the elements and makes it easier to stay up and socialize when temperatures drop at night. Finally, don’t forget about the principles of “Leave No Trace.” Be prepared to pack out all of your garbage and solid waste, and use a shovel to cover up whatever snow you dug out for camp. This way, the next person will be able to enjoy the same sense of solitude and pristine wilderness that you encountered.